Part of E.P. 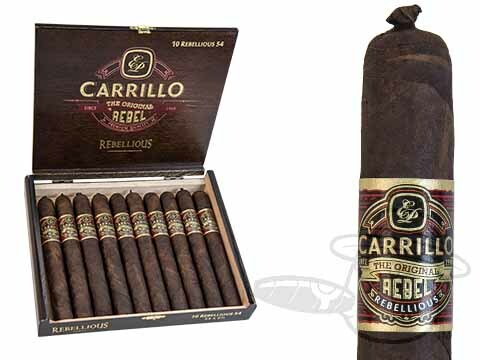 Carrillo’s innovative Dimension Series of larger-ring cigars, the Original Rebel Rebellious combines a dark and creamy Connecticut Broadleaf wrapper over an Ecuadorian binder and select Nicaraguan filler tobaccos to bring you a deep and decadent smoke that conveys a mosaic of bold and balanced flavor notes. The Rebellious’ smooth delivery of dense earth, cocoa sweetness, woody, toasty, and zesty tones is complimented by the clean, cool draw that its generous ring size provides. This layered profile, combined with an unquestionably full body, equals a cigar that satisfies on all levels. But really, what else would you expect from cigar virtuoso E.P. Carrillo? The man has building great cigars down to a science - smoke one and see.